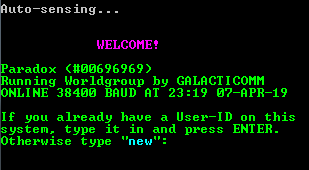 If you are new to the process of Telnet and have never accessed a Telnet BBS system before, the following is a mini-tutorial of how the Telnet process works and how to use a Telnet client. You can also use the command line from your operating system. Though this will work, the graphics may or may not display correctly. By default, Windows does not install the Telnet Client in Windows anymore. You will need to “turn on” the Telnet Client first. Once that is turned on, you can either open up a Command Prompt, or run the Telnet command from the Run menu.